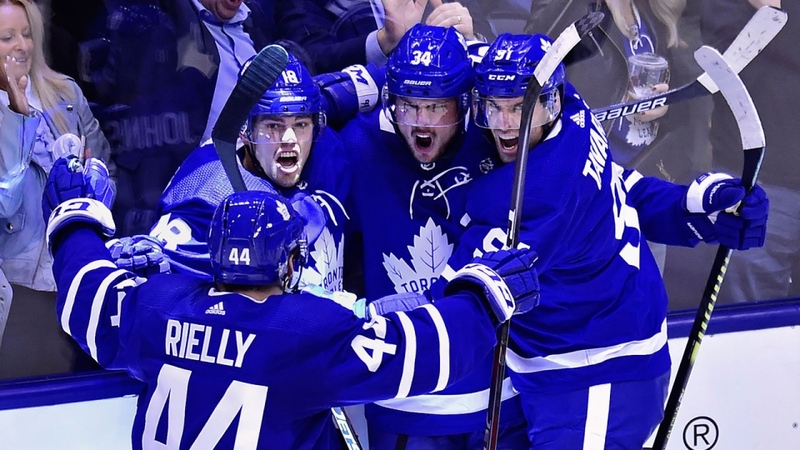 TORONTO -- Auston Matthews scored his first goal of the playoffs and set up another as the Toronto Maple Leafs defeated the Boston Bruins 3-2 on Monday to take a 2-1 lead in their best-of-seven Eastern Conference quarterfinal. Criticized for his play in the Bruins' seven-game victory over the Leafs' in last spring's first round, the 21-year-old Matthews was immediately serenaded by chants of "Aus-ton! Matth-ews!" by the crowd. Boston kept up the pressure with Rask on the bench for the extra attacker, but Toronto held on despite some tense moments late -- including two key blocks from Marner -- to take a 2-1 series lead. Note: Game 5 is set for Friday in Boston. Game 6, if necessary, would be back at Scotiabank Arena on Sunday. ... Bruins defenceman Connor Clifton sat out with an undisclosed injury, while winger Marcus Johansson missed a second consecutive game with an illness.